Last week I wrote about the benefits of introducing children to great works of art and gave some suggestions to help you do just that. This week the fun continues 🙂 Here are some creative activities to help you engage with great works of art. Have fun! Role-play is an easy way to step into a painting and add some movement. Invite your children to mimic the movement of the people they see in the painting. We see a wonderful example of that in Kirsty’s picture above. Invite the children to hold an imaginary paintbrush and use it to paint the movement they see in the sky or draw the hills. Ask them to identify shapes in the picture, like the circular stars, or the triangle in the pointed steeple of the church. Then trace those shapes with your hands. If you want to go larger, use streamers to make extra large movements. 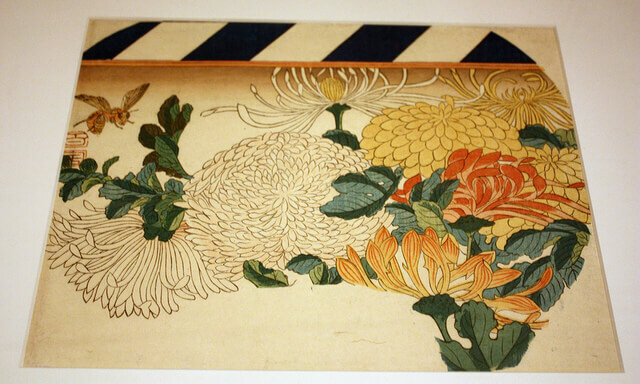 Or you could take a picture like Chrysanthemums: a Japanese print of a bee hovering over some flowers (pictured below), play Rimsky-Korsakov’s The Flight of the Bumblebee and have the children buzz around the room like a bumblebee. What fun! Photo attributed to Peter Roan. Alison over at No Time For Flash Cards has created five simple games you can play with your kids at the art museum to keep them engaged with the art. My favorite was I’ll Take That One where each person gets to choose one piece of art that they pretend they can take home. They must also say where they would put the piece in their own home. Now let me see… I think I would take Van Gough’s “Starry Night” or maybe something by Picasso! What about you? 3. Let the art inspire your own artistic endeavors. One of the best things about great works of art is that they can inspire our own creativity. You’ll also need some basic art supplies. A simple set of watercolor paints, some crayons and pencils are things most families have on hand. You might like to try something different like a set of chalk pastels. Here are a few art projects to get your creative juices flowing. Take a look at this idea published by Anna at The Imagination Tree. Van Gogh’s picture Starry Night inspired a finger paint printing and the results (above) are just gorgeous. I enjoy abstract painting, so I really liked this free flowing activity inspired by Jackson Pollock on Meri Cherry. The perfect activity for a warm summer day. Head over to Art lessons for kids to find Picasso Inspired Faces. Aren’t they fun? Patty at Deep Space Sparkle used The Tree of Life by Gustav Klimt as inspiration for an art project. I’m ready to try one of these myself! Visit my Pinterest board to find lots of creative activities based on works by great artists. Follow Rediscovered Families’s board Enjoying Great Works of Art With Children on Pinterest. Red Ted Art has myriads of art projects suitable for children of all ages. Just type the name of the artist you want to explore into the search on the blog. Whatever you do remember that this is supposed to be fun! The great thing about art is that there is no right or wrong and you can interpret a piece of art anyway you want. That makes it really easy doesn’t it? I’d love to hear from you. Do you have any activities based on great works of art you would like to offer? Post any links in the comments below. This is a great post and a different way to view art with kids. One lovely idea I saw on Be A Fun Mum was to buy an old print from a second hand shop and get the children to paint in objects, animals etc. What a lovely idea! Thanks for sharing Eva. Good ideas. I’ve not thought about getting the children inspired by a piece of art work. I should give it a go. Great list of activities, I know they would engage my daughter for sure! This comment makes me happy 🙂 Let me know how it goes! What fabulous ideas, I’ll be pinning this a couple of times to different boards for use in the near future. Thanks for linking up to Mom’s Library, I’ll be featuring you this week at Crystal’s Tiny Treasures. Great ideas! Thanks so much for sharing at Mom’s Library; makes me want to head to the museum! Featured you this week!